We were thinking that it might not take all that much money to put a bounty on plastic - paying people to carry it in. Then poverty would create a clean up rather than a mess. Steve, this “bounty” has worked well with bottle bills in several American states for decades. The deposit on beverage bottles in Oregon is now ten cents apiece, and you would be hard put to see an empty just lying around in public. As far as trash in the developing world, often there simply is no place for people to take it that they can afford. 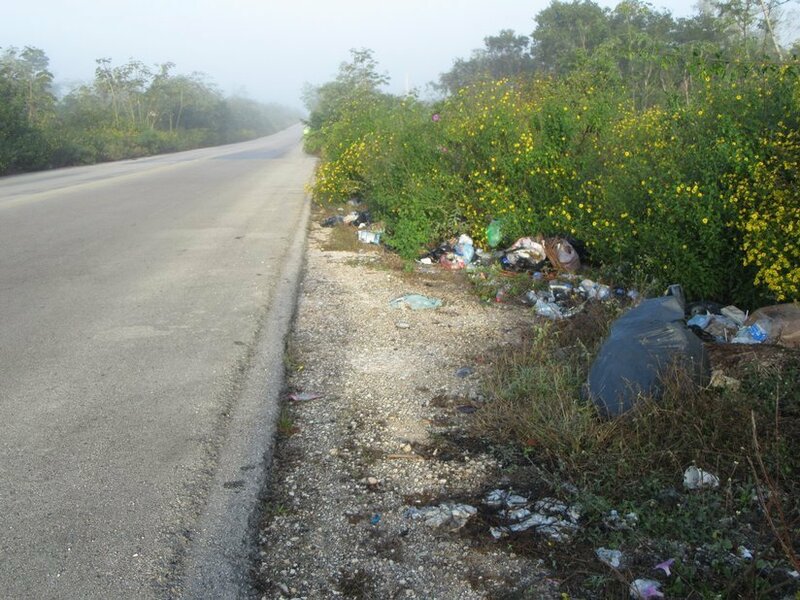 In good-sized towns there is trash pickup but out in rural areas there often none. I am old enough to remember when litter bags were provided free in cars and more people stopped tossing their garbage out the window. That ethic seems to have dissipated somewhat here in Portland, we see trash everywhere these days, really disappointing and unattractive. We were told in Laos that years ago, everything was wrapped up in banana leaves, which were tossed on the ground afterward and eaten by animals or turned into soil. It kind of makes sense that somebody with little to no education would not understand that the little plastic bags do not go away for hundreds of years and just continue the habit. In any case, I like this discussion and hope it continues. Thanks, everyone. South Australia has had a bottle deposit scheme for about forty years and some of the other states are now considering similar schemes. As for litter in some third world areas if there is no local authority raising rates there will be no rubbish removal. The original basis function of local authorities were to raise rates and provide roads and rubbish removal. I haven't bought or used a drinking straw in decades. I'm old enough to remember paper straws and can't recall when or why we ever changed to plastic. The same goes for paper bags. Why did we change to plastic? I can also remember market goods and food wrapped in paper or banana leaves, and roadside/trackside Indian tea served in throwaway clay cups. And again can't recall when or why that ever changed. Reusable plastic water bottles eventually get so funky you can't clean them properly and I always end up losing my expensive stainless steel bottles. So when touring now I just get a generic bottle of water from the 7-11 and refill it as many times as I can (before I eventually lose that one too). We had a Steri pen once, it broke. Now we use a Sawyer Mini. It's relatively cheap, has no battery or moving parts, lasts a long time and works well. And I feel very guilty every time I get on a plane. Does that count? I always thought those hotel bathroom messages about saving the planet by sorting used and unused towels were self serving more than ecological. But now we have run into a new one (on us, anyway) in the form of a major hotel at the Paris airport not providing towels at all. Instead they propose to sell you one, if you foolishly insist on bathing, or drying, for 3 euros. I think I will opt instead to dry with their pillowcases, assuming they have those. Clearly for 90 euros or so there is not enough surplus to have a towel! I wrote to ask if they were serious about this - but no reply. Clearly they did not want to burn up the needed electricity. Wow, that’s breaking new ground! I’ve never heard of that one before. I’d say I didn’t believe it and thought you were all wet, but that’s too easy. What’s the hotel? It’s probably karma, your payback for your rashness in deciding to book all your lodging in advance. And if they don’t have pillowcases either, I suggest writhing on the rug. Which hotel chain is that, Steve? Forewarned is forearmed. I'll be travelling with a large travel towel for my camping leg but hadn't thought I'd need it for the roofed-accommodation part. I always have a "PackTowl Personal Towel" with me; it's ideal as a sweat wiper among other uses (but not large enough for when you forget to take your clean clothes to the shower block and really don't want to put the sweaty ones back on). I'm pretty sure I didn't book anything that didn't include bedding and towels but I'll be checking before we leave! Booking's final suggestion is to look elsewhere. Good idea! That assumes they have a rug! However a "triple" room may be the same price as a double, so that would allow one cot to writhe on. Only thing, it's a shared bathroom so you have to skip down the hall wet and naked before reaching your writhing spot! We are paying a bit more, nonrefundable (but neither are our flights), at the Holiday Inn Express. We will be coming all the way from Vancouver and having stayed at the HIE at Geneva airport 2 years ago, we know what to expect. Room with bath (and towels), comfortable bed (with bedding) and breakfast (not a 10-jammer, but better than most chain hotels in Canada). The big plus is that they will store our cases when Al brings them back from Bordeaux--we didn't manage bike spots on the TGV.